This week's deals are awesome! I love the Banner Punch, and the Hip Hip Hooray Card Kit has been on my wish list for awhile... I hope you find something you like! Sorry for the different format this week. The place I usually copy and paste from was messed up this morning, but I still wanted to share! Maybe this way is better? Comment and let me know which way you like. Do you have just one scrapbook you are working on, or do you work on several at a time? I have a few that I need to put together, and I like the variety of switching back and forth, depending on what I feel like working on. A few weeks ago, I started putting this page together, and I had to order a few pictures to complete it, so now I can finally share it with you! The Love Story Project Life Cards & Accessories from Stampin' Up! are great for scrapbooking your love story! This time, I added a few of my own embellishments to make it special. I cropped one of the 3x4 Project Life cards and a picture, also cut to 3x4, on a piece of Night of Navy cardstock. That opened up lots of options, because I wasn't stuck using a 4x6 card or photo. I also added some Rhinestones to the 4x6 card on the top. I think it gave it a little something special. And of course, Project Life cards are great for journaling! As I'm scrapbooking my wedding day and the events surrounding it, I want to write down all of my memories. This is just the beginning... stay tuned for more pages to come! Today I am happy to share with you my first video! This was my second month of receiving the Paper Pumpkin kit, and I am just loving it so much that I had to share! I have been challenged to find 4 new Paper Pumpkin subscribers in the next six weeks. Do you want to be one of them?!? I love to pamper my subscribers with little thank you gifts and incentives. (Plus, the kit is a great value and so much fun to receive every month!) If you are interested in subscribing, please visit my Paper Pumpkin site. Once again, I'm running behind on getting birthday cards out on time. Story of my life. Anyways, I went back to my August Paper Pumpkin kit and it helped me out again! I just loved how the Lucky Stars embossing folder fit with the little star card in the kit, so I decided to go with something similar to what I did here. I'm excited to show you this month's Paper Pumpkin kit, hopefully on Friday! If I get real brave, I might even make a video... We'll see how naptimes go this week. I will send you your cards next week. Congratulations! I am busy holding a garage sale this weekend, so I'll be back on Monday with a new card for you. Have a great weekend! The new flower punch. This comes with 2 other punches, a little star and a little heart, and they are on the top of my wish list! The In Colors. What a great way to show them off! The simplicity. This is a very simple card, but so nice! Anyone would love to receive it! Thank you to my fellow demonstrator who created this card! It's beautiful! Just a reminder that today is the last day to enter my giveaway. I'll be back tomorrow to announce the winner! Don't forget to check out my giveaway! Only a few days left to enter! Today's beautiful card comes from a swap I did with my team. I can't take credit for it, but someone has some great creative juices flowing! If it's your card, thank you for sharing! This card features a hostess set called, you guessed it, Hello There. I love the writing used in the greetings in this set. 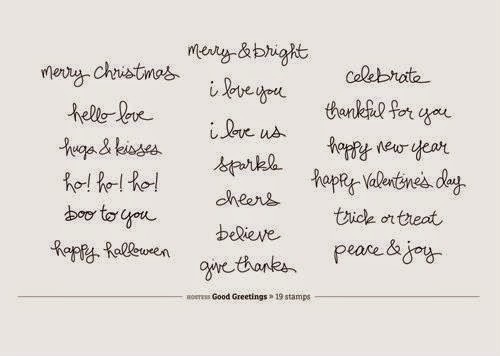 Wouldn't you love to receive this card? If you'd like a chance to buy this hostess set, now is a great time to have a party! Not only can you purchase great hostess sets like this one, but you also have a chance to earn a free stamp set, Good Greetings, with a party that has at least $300 in sales. Good Greetings is an exclusive set that will only be available during its promotion, now through October 31. I love this one too! The greetings included are great for all of the holidays coming up. If you'd like to schedule a party with me and earn this set for free, please let me know! I'm working on scheduling my October parties now. Finally, don't forget about my giveaway! You have until Thursday to enter! A Merry Christmas Card... and a Giveaway! Yesterday I was busy cutting things out for my Christmas Card event this Saturday. I was left with a bunch of scraps from the Expressions Thinlits (retired), and the scraps were so pretty, I knew I had to use them on a card! Stamps: none needed for this card! Now for the giveaway! To celebrate 1000 page views, I will be giving away a set of 5 of this card! To enter, you must do two things: 1) like my business page on Facebook and 2) comment and tell me what your favorite Stampin' Up! product is. Make sure to leave your email address in your comment or message it to me on Facebook. You have a week to enter - entries will be accepted through Thursday, September 18. I will announce the winner next Friday! Last Day for the Paper Pumpkin 1/2 Off Sale! It has been a busy and tiring week for me, but I wanted to drop in and remind you that today is the last day to get 2 months of the Paper Pumpkin monthly kit for 1/2 off. I am busy getting thank you gifts ready for my subscribers who signed up during this promotion. Don't you want to be one of them?!? $5 off of your next order from me! I'm sorry if I've been repeating all of this information a lot lately, but it is such a great deal, I can't help but share! There's no better time to try Paper Pumpkin! You can cancel or take a month off at any time. To try it out for yourself, click here and enter the promo code HALFOFF2, and you will get to enjoy your first kit as soon as next week! Thank you to those of you who read my blog! Today I reached 1000 page views! I think that calls for a giveaway... so stay tuned... I'll come up with something later this week! Paper Pumpkin 1/2 Off Sale Ends Wednesday! A crafty kit, delivered to your door around the 16th of every month. A few freebies from me as a thank you for your subscription. AND, for the last few days of the sale, if you sign up for Paper Pumpkin and choose me as your demonstrator, I will take $5 off of your next order with me! You can get all of this for $9.97 for your first two months, and $19.95 after that. That price includes shipping; the only additional cost will be tax. You can cancel at anytime (although I don't think you'll want to after you see all of the great things in these kits!). Click here to sign up or find out more. Please note that all of the extras are only offered by me, Rachel Traudt. You must choose me as a demonstrator to get the extra benefits listed above. Don't wait too long! The sale is almost over! The best part - by signing up during the sale, you will get September's kit delivered to your door very soon! My upline, Amy Rich, shared this awesome idea of how to use the August kit. (I think I'm going to do this with mine!) Enjoy! It seems like everyone I know who is having a baby is having a boy. So this week I needed two baby boy cards - one for some friends who had a sweet little boy on Labor Day, and the other for a baby shower I'm invited to this weekend. The color in this paper stack that I pulled out to use is Soft Sky, which I think is a perfect baby boy color. I also snuck in a few Pool Party embellishments, but they coordinated perfectly, don't you think? The button is from a retired Sale-a-bration pack, and the Pool Party Baker's Twine is also a retired gem. Cute and sweet, just like the babies! If you remember my first attempt at Project Life, it took a long time for me to put a page together. When I got everything back out to finish up my pictures from a fall hike in 2010, it went much faster! I whipped out 3 more pages plus added a little bit to the first page that I did, all during naptime (which, let me tell you, is not very long some days!). Let me tell you something: I am loving Project Life! I wasn't quite sold on it at first, because I really like the look of traditional scrapbook pages. But I've realized that I will never get all of my pictures in a book if I scrapbook them all the traditional way. Project Life allows you to easily slip pictures into an album, and then add as much journaling and embellishment as you want. And you can go back and add more of that later! But at least my pictures are getting in a book. And I am documenting my memories before I completely forget them. I added to this card on my first page. I used the Skinny Mini Alphabet stamp set and Basic Gray ink to create the heading, and stickers from the Happiness Is Project Life Accessory Kit. You can see the original page by visiting the link above to my first attempt at Project Life. This was my next page. I do plan to put a heading in the middle square, but I think the Skinny Mini Alphabet is a little too big for the phrase I want to use, so I'm still thinking about what I want to do there. The next page was just pictures, which I think is totally acceptable in Project Life scrapbooking. It's possible I made add some stickers or something later, but for now, the pictures are in there and it would be fine as is too. My last page for the day, and I even did some journaling! The Project Life Journaling Pens are great for this. They come in a 2-pack, two different sizes. I used the skinnier size. I love the little heart and arrow sticker on the bottom picture. The accessory kits make it really easy to add embellishments that coordinate with everything else. Now that I've gotten into the Project Life groove, I ordered some more pictures (Shutterfly had a Labor Day sale! ), and I'm working on an order for more Project Life products as well. I can't wait to share more with you, and I'm so excited to finally get some scrapbooking done! After I did these few pages, I just wanted to keep going (but of course one of my kids woke up). P.S. Stampin' Up! shared with demonstrators yesterday that some additional holiday products will be released in October, including more Project Life items! I can't wait to see what they look like!